We left home almost late last night bec. I was on YM with sistah Joy. We were talking about their last trip in Canberra and she told us that the kids had a blast esp. Braiden. Although they stayed there for only a day. It was a good break for all of them. We were also talking about mom's forthcoming 75th b-day in Oct. and our plans for her party. Each of us siblings were goin to contribute money for the party bec. we want it to be special for our mom. 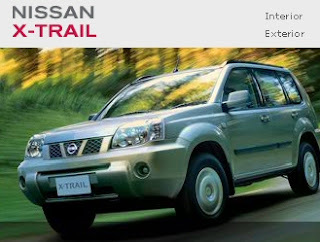 She also told us that she finally had her new car which is a Nissan X-trail that she trade-in with her old Nissan Patrol. The Patrol is kinda big for her so the Xtrail is just perfect. She's been driving for a while now of course when you are abroad it is a necessity to have a car of your own to move around easily. Her husband also got a new Nissan Ute for himself, not quite sure though if my bro-inlaw would upgrade his billet grille into a customized one. Now that they both have new cars, i hope they will reorganized their garage so that both will fit inside. Good choice of cars for both of them. Wise pick!